Woodbury, NJ is not the first area to come to mind when seeking a good BYOB in South Jersey. 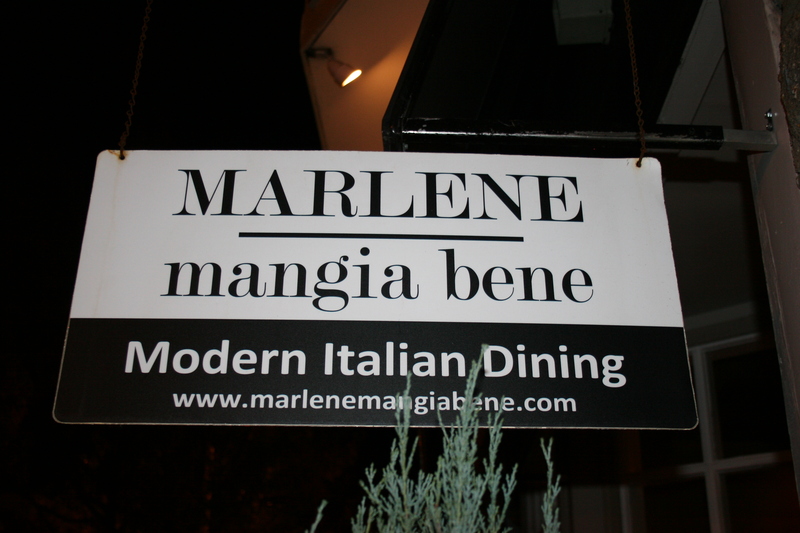 We had heard some good things, though about a fairly new restaurant called Marlene Mangia Bene and the eight of us decided to give it a try last night. Located at 43 South Broad Street on the main drag of Gloucester County’s seat of government. It is certainly an area that could use some nice dining spots so we were all anxious to see if it would live up to its advanced billing. My wine choice for the evening was a 2008 Almesa, Syrah, Paso Robles, CA. I had purchased four bottles of this wine from an internet site called WINES TILL SOLD OUT (WTSO). Each day they send out 4 or five emails featuring a greatly reduced wine, averaging about 40 or 50% off the previous best price, and the deal remains on until, as you may have guessed, the wine is sold out. They also offer free delivery if you purchase four bottles. This was my first time buying from them and I actually knew nothing about the Almesa Syrah. I am happy to report that the wines was great and the price was fantastic. It was a great food wine with plenty of dark fruits with hints of pepper and spice all in a nicely balanced structure. There were some nice choices on the appetizer section of the menu and Gerry went with the Eggplant Involtini. The eggplant was stuffed with goat cheese and he really enjoyed his choice. Joe had the stuffed long hots and although they were very good he felt that for $10.00 there should have been more than two of them. 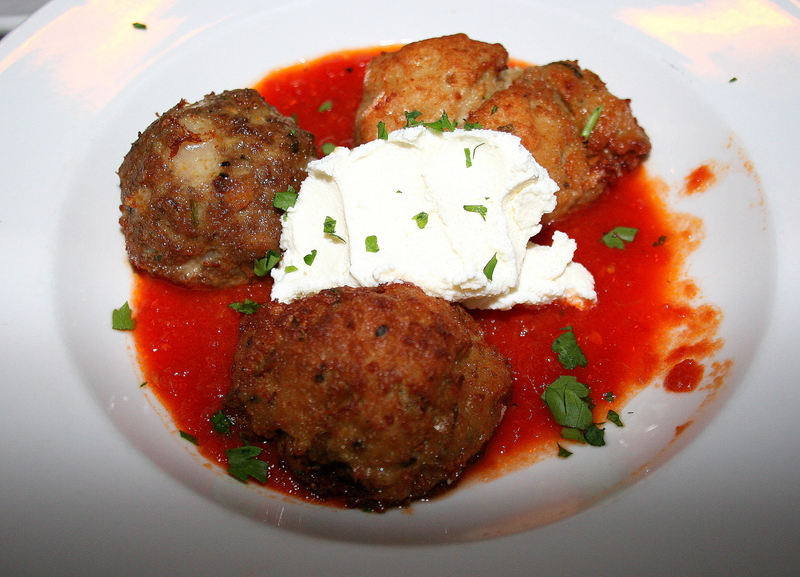 I had no trouble making my decision as I had to try Marlenes Meatball Medley, 3 homemade meatballs stuffed with mozzarella, pork and tender veal and topped with ricotta cheese and marinara sauce. They were delicious and a decent size portion also at $10.00. 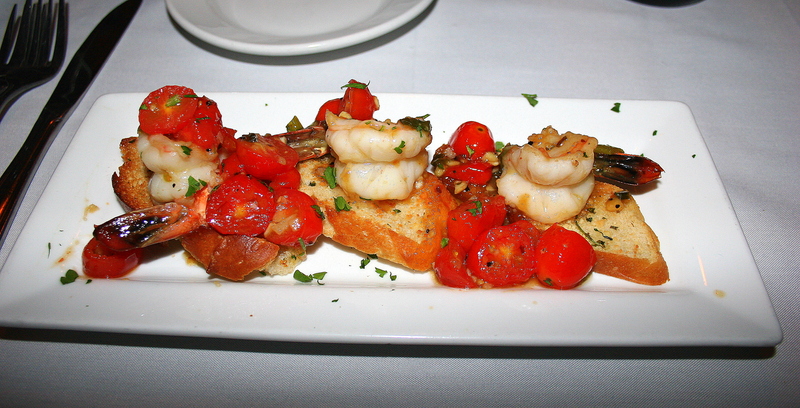 Carol’s appetizer was the unique Shrimp Limoncello, jumbo shrimp on crostini toast with limoncello sauce and crushed tomato. One of the staff explained that this dish was created from an accident when someone inadvertently spilled limoncello on a shrimp dish. Everyone tried it in the kitchen, they all liked it, and it was added to the menu. 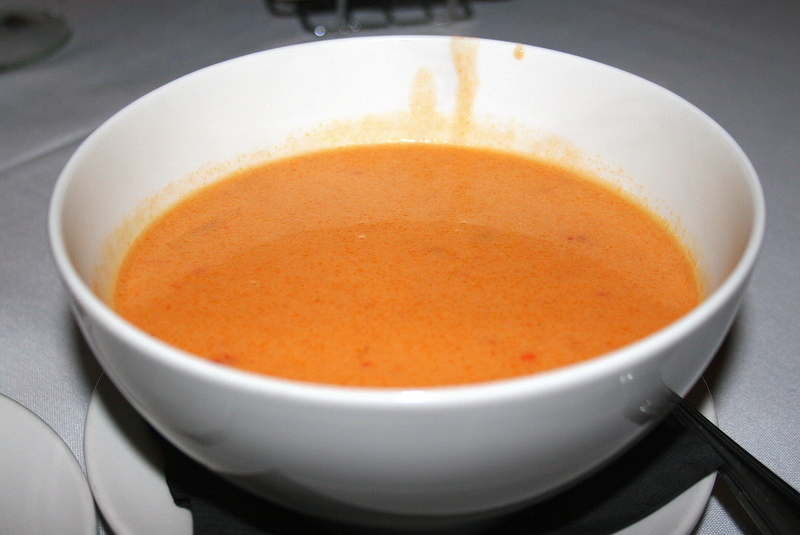 My wife, Kathy, had a bad cold but she couldn’t resist ordering the Lobster Tomato Bisque. I tasted it and it was good. I think lobster bisque should be served without any additions. I mean. why add tomato flavor to something as totally delicious as lobster? At $12.00 for a soup offering I expect it to be more lobster and less tomato. There was a pretty decent delay between appetizers and entrees which didn’t bother us because we were busily engaged in conversation, mostly about the results of the recent Presidential election and exactly how quickly Andy Reid should leave town. When the main course did arrive, three of party selected the Chicken Martino (actually, one had it as a veal dish. 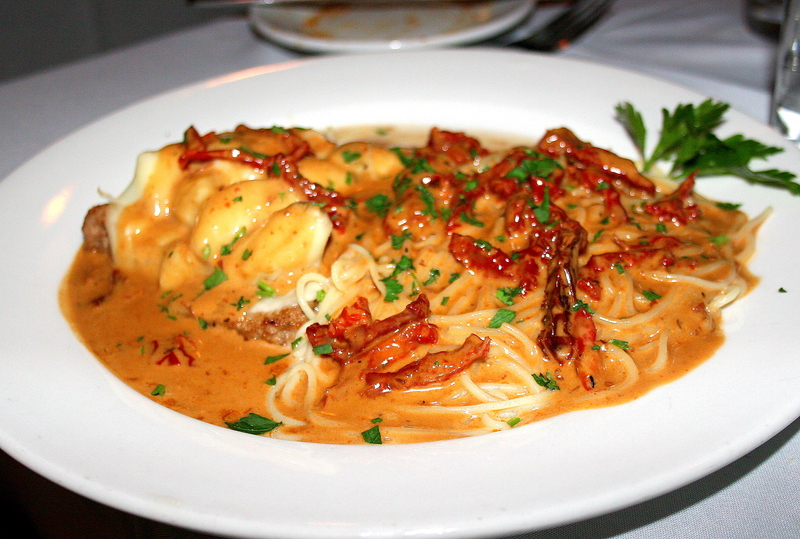 This dish came with chicken ($20.00) or veal ($22.00) and consisted of sauteed medallions, wild mushrooms, sun-dried tomatoes with a light demi-glaze sauce served over a bed of capellini. Everyone was pleased with their order but one of the dishes was overpowered with the sauce and very light on the portion of capellini. It was very noticeable with the two other orders to compare it with. The restaurant was kind enough to not only replace the dish but took it off the bill and provided a free dessert. It’s a great sign of caring about your customers and your business when such service is provided. Mistakes can happen and as in this case they often provide an opportunity to show your professionalism. 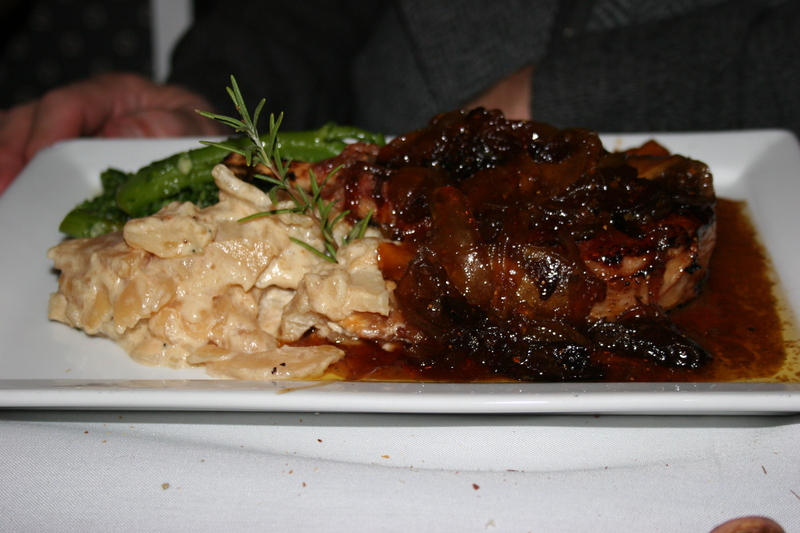 Joe had the Harvest Pork Chop, bone-in pork chop grilled to perfection and topped with a fig, apple and grand marnier topping and served with veggies and scalloped potatoes. There was nothing left but the bone when Joe was done with his meal. Sue had one of the specials of the evening a Chilean Sea Bass which she really enjoyed. It looked like an outstanding piece of fish. Gerry had a Veal Chop and he had no complaints whatsoever. For my entree I went with the Jumbo Sea Scallops, pan seared scallops in a grand marnier glaze served with roasted plum tomatoes and sauteed baby spinach. 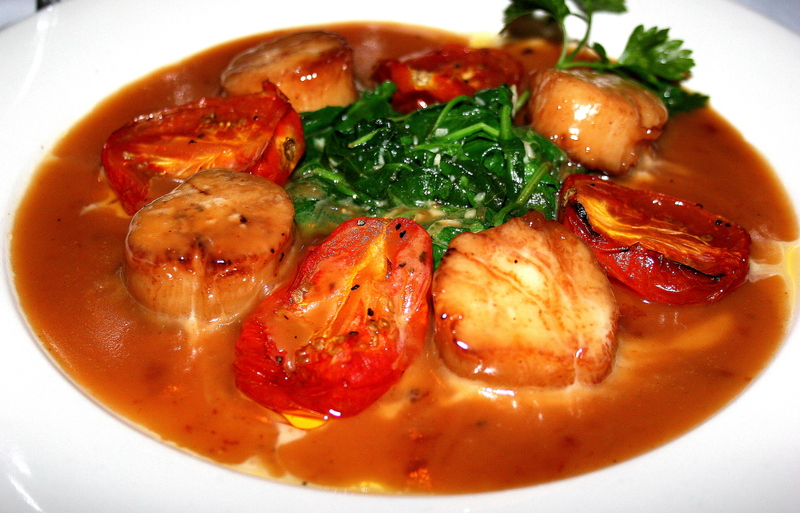 The four scallops were indeed jumbo and the grand marnier glaze was the perfect topping. I really liked my dish. It was done perfectly and the spinach made a nice accompaniment to the scallops. We topped off our dinners by passing around the Hi-Five cake, multiple layers of a rich chocolate concoction topped with creme fraiche and drizzled with more chocolate. The house also offered each of us our choice of three different appertifs, a basic limoncello, a basil-infused limoncello and a spiced apple concoction. Although they were all tasty, they were also very weak without any taste of alcohol noticeable. We all thoroughly enjoyed Marelene Mangia Bene. It’s a breath of dining fresh air in a town that badly needs fine dining. I’d say the prices here, compared to much of Collingswood, would be slightly on the high side but the food quality is there so I can’t complain about the pricing. I’m sure we will return and I would recommend this dining establishment to anyone who enjoys well prepared dishes.